Sweet Potato What?! Sweet Potato GREENS! The classic sweet potato. What is there not to love? It’s savory yet saccharine. Nutritiously beneficial yet candied confection. You get the best of both worlds with in this vibrant root vegetable. From pies to fries or smothered in marshmallows, we all have our favorite sweet potato dish. But I’m not here to talk about the sweet potato. I want to share with you what my fellow foodie and good friend, Christina, introduced to me during a visit a couple of weeks ago. We were admiring the sweet potato vines, running rampant, in my garden. 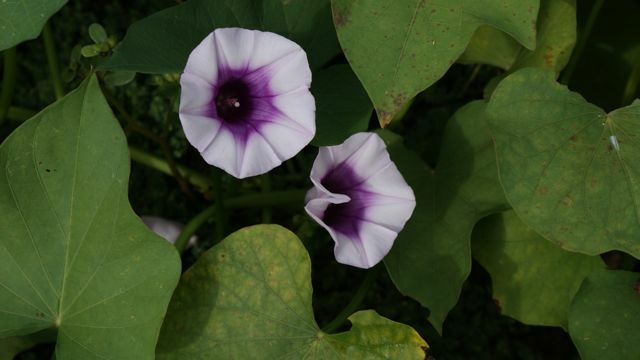 They have beautiful heart-shaped leaves that produce pretty purple flowers towards the end of the summer. They would make a charming ground cover in any flower bed as well as a lovely potted plant while climbing up a trellis. But guess what? There’s more! You can eat the leaves! What?! Yes! 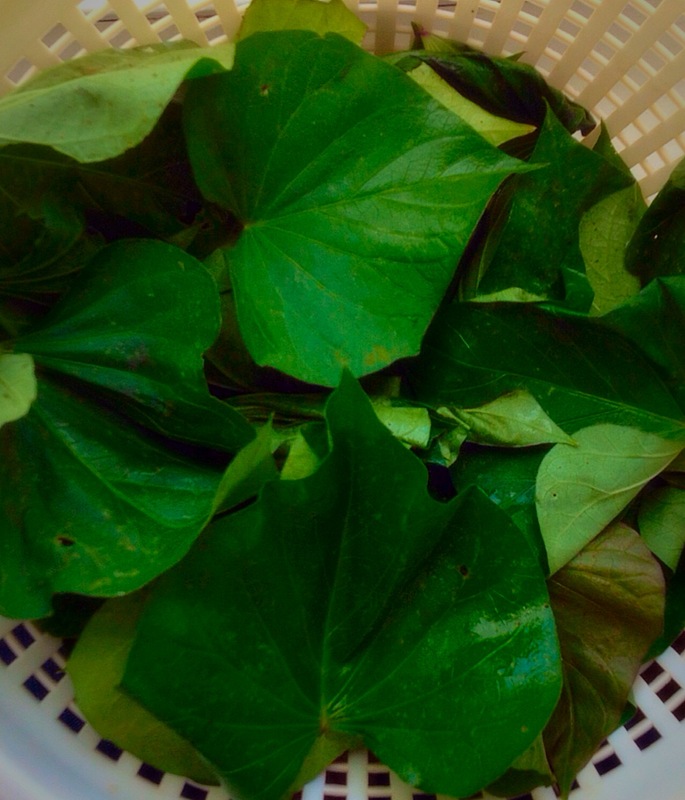 Although uncommon in typical North American cuisine, sweet potato leaves have been used in Asian, African, Central and South American and Pacific Island cooking for years. They don’t waste a thing! 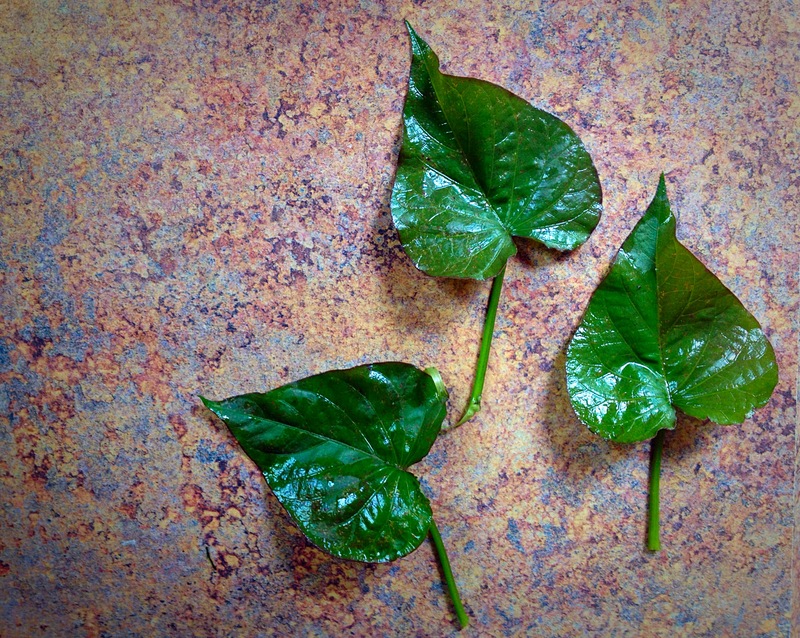 Sweet potato leaves are tender and mild in flavor; delicate like spinach. They are tender enough to eat raw in salads and thrown into stir frys. 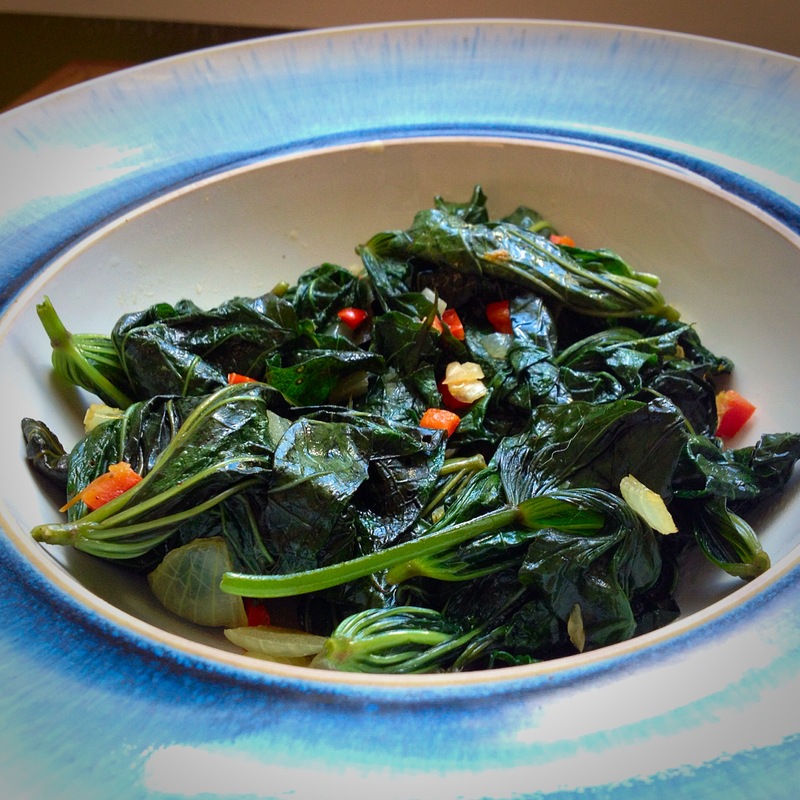 A handful of the leaves are a great addition to soups and stews as well. Sweet potato leaves are easy to store. Rinse in cold water and pat dry. Wrap the clean leaves in a dry paper towel, inside a plastic Zip-Lock and keep in the refrigerator until ready to use. Sweet potato leaves are low in saturated fat and sodium, and very low in cholesterol. They are also a good source of protein, niacin, calcium and iron, and a very good source of dietary fiber, vitamin A, vitamin C, thiamin, riboflavin, vitamin B6, folate, magnesium and potassium! Eating raw or light saute will keep most of the nutritional value intact. If you have a picky eater on your hands or just like to trick people, like me, chop up a handful of sweet potato leave and throw into a pot of spaghetti sauce or chili. The picky eater/ victim will never even know they were in there, but you will know that they’ve taken in a nutrient rich green veggie! I have never came across sweet potato leaves in my local grocery stores. If you don’t have a green thumb, do a little research. I’m sure a farmers market or specialty store will have some readily available for you. I tried out my sweet potato leaves for the first time yesterday. I gave them a light saute in olive oil and added some onion, garlic and a little red bell pepper for some color. They were absolutely delicious. I can’t believe I’ve been missing out on these beauties this whole time. This entry was posted in Breakfast/Brunch, Dinner, Food, Gluten Free, Holiday cooking, Leftovers, Light, Low Carb, Munchies, Recipes, Salads, Sides, Soups and Stews, Vegan/ Vegetarian and tagged sweet potato, sweet potato greens, sweet potato leaves, sweet potato vines. Bookmark the permalink.